December 7, 1941 − like September 11, 2001 − began with fine weather and bright sunshine. Both days began with complacent Americans who planned to spend the day in their usual, peaceful activities. Both days began with other people who had other plans. Both days ended with many Americans dead, and the rest awakened from their slumbers. December 7 was a Sunday. Some people slept late. Others went to church. Personnel at the U.S. Navy Base at Pearl Harbor, Hawaii and at Hickam Army Airfield were on their usual Sunday schedule. Sailors stood at attention on the decks of battleships moored on battleship row, waiting for the band to strike up the National Anthem as the flag was raised. Out of a clear blue sky came Japanese planes filled with bombs and torpedoes. Before the day was over, about 2403 military personnel and 68 civilians lay dead, and many others were wounded. Some were trapped in sunken ships, from which tapping could be heard until just before Christmas. Most could not be rescued. It was not a merry Christmas. We knew that the rest of the world was at war. We knew that Hitler had renounced the treaty that ended World War I. We knew that he had enlarged the German armed forces. We knew that he had bullied France and Britain into handing him part, then all, of Czechoslovakia. We knew that he had invaded Poland and carved it up with Stalin. We knew that he had conquered France in six weeks. We knew that he was bombing Britain and advancing across the Soviet Union. We also knew that the Japan had conquered Manchuria for its resources. We knew that Japan had invaded China with startling brutality. We knew that Germany and Japan had big appetites and were still hungry. We knew all this, and still we slept late that Sunday. We thought we were safe. After Pearl Harbor caught us shamefully unprepared, one would think that we would have learned not to disarm − physically or psychologically − when World War II was over. One would be wrong. September 11 was a Tuesday. In New York City, it was Election Day and the first day of school, so many people were late for work. At the Pentagon outside Washington, people were prompt, as military personnel are. Out of a clear blue sky came airliners filled with passengers and crew − and thousands of pounds of jet fuel. Before the day was over, almost 3000 Americans were dead and others injured. The exact total will never be known, because hundreds remain missing. ● Sen. Robert Kennedy, a leading presidential candidate, was assassinated in 1968 by Sirhan Sirhan, a Palestinian immigrant who objected to Kennedy’s support for Israel. We learned nothing from this. ● Our embassy in Iran was seized in 1979 − an act of war. Our diplomats were mistreated for 444 days. President Carter dithered, then ordered an unsuccessful rescue attempt. The hostages were released the day President Reagan was inaugurated. We learned nothing from that, either. ● Our Marine barracks in Beirut was bombed in 1983, killing 241 Americans who were there on a peacekeeping mission. We fired a few shells into the hills, then withdrew. ● The USS Stark was hit by two missiles “accidentally” fired by an Iraqi plane in 1987, killing 37 crewmembers and wounding 21 others. Saddam promoted the pilot and gave him a Mercedes. We appointed a commission to investigate. ● Saddam invaded Kuwait in 1990. We and our allies drove him out in 1991, but a low-level conflict smoldered, with Iraqis shooting at our planes in the no-fly zone. ● The first World Trade Center attack occurred in 1993, when six died and over 1000 were injured, but the buildings did not collapse as planned. We treated the attack as an ordinary crime, and merely arrested those directly responsible. ● Our humanitarian mission in Somalia in 1993 resulted in the deaths of 18 soldiers, as described in “Black Hawk Down.” Some of the bodies were dragged through the streets. We promptly withdrew. ● Terrorists bombed our Khobar Towers barracks in Saudi Arabia in 1996, killing 19 Americans and injuring many more. We treated the attack as an ordinary crime. ● Our embassies in Kenya and Tanzania were bombed in 1998 – again acts of war – causing hundreds of deaths. We treated the attacks as ordinary crimes. ● Suicide bombers tried to attack the USS The Sullivans in January 2000. The ship was named for the five Sullivan brothers, who died together when their ship was sunk by the Japanese in World War II. But the bombers’ boat was overloaded and sank in Aden harbor. One would think we would have learned from this narrow escape. Again one would be wrong. ● Suicide bombers attacked the USS Cole in October 2000 in Aden harbor. The ship almost sank, 17 sailors were killed and many injured. We did nothing. Yemen arrested some suspects, who later “escaped” from jail. But unlike us, at least Yemen pretended to do something. One would think that after all these attacks, we would recognize that we were under attack. And again one would be wrong. We continued to doze in a peaceful stupor. But when history repeated itself on 9/11, the price went up. 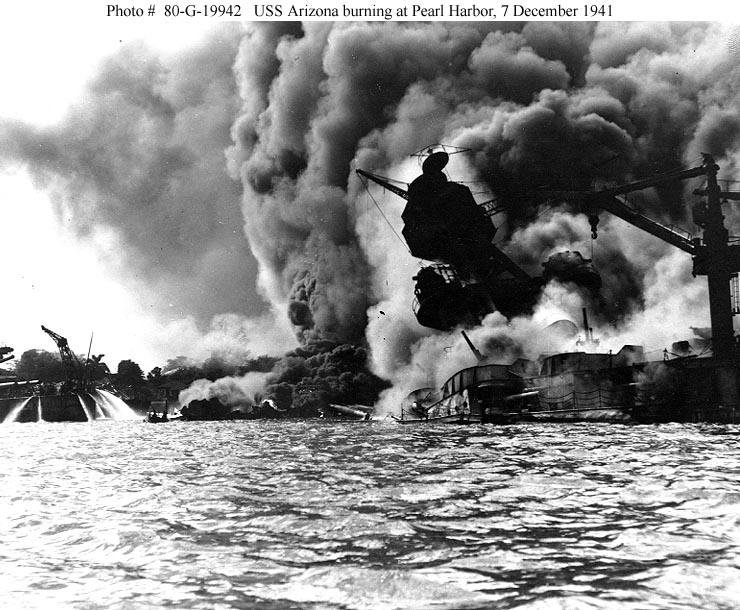 The death toll on 9/11 was higher than in 1941, and unlike Pearl Harbor, most of the casualties were civilians. Moreover, we watched it on live TV instead of reading about it in the papers. The awakening was even ruder. But no matter how rude the awakening, there is always the risk of dozing off again. That is why modern alarm clocks, unlike the clocks in 1941, have a snooze button. Unless we were in the military, we went back to sleep. For example, most tall buildings still don’t have a helipad, which could have saved many on 9/11. Most modern Americans are unused to getting up before dawn to tend farm animals. They watch hours of TV, not because it’s always interesting, but because it’s always available. Most modern Americans are more accustomed to being entertained than to facing unpleasant realities. We want quick answers to complex problems. We want the world to be like a video game. If the answer doesn’t come quickly, we tend to lose interest. If our war against terrorists isn’t over fast, our minds shift back to our everyday interests. We revert to a 9/10 mindset in a 9/11 world. We are losing our ability to fight a determined enemy. We measure the war in weeks and years. Our enemies think in decades, even generations. We count our casualties by the day and by the month. Our enemies don’t count theirs at all. But the world is not a TV. We have no remote control. Whatever degree of control we do have must be exercised on the scene, not remotely, and with difficulty and danger. Nor is the world an alarm clock. There is no snooze button. If we are so lazy and uncaring as to go back to sleep after the alarm has sounded, we will deserve what befalls us. If we allow ourselves to doze off in a 9/11 world, our prospects for a long sleep are excellent. A prior version of this article appeared in 2007. Little has changed since then, and what did change has changed for the worse. Dr. Stolinsky writes on political and social issues. Contact: dstol@prodigy.net. You are welcome to publish or post these articles, provided that you cite the author and website.